This Chronicles of Crime: Noir review was made after playing through the four cases in the box. We were sent a copy of this game by the publisher in exchange for an honest review. What is Chronicles of Crime: Noir? Chronicles of Crime: Noir is an expansion for the cooperative detective game Chronicles of Crime. This expansion takes place in post-World War II California and it includes new characters, locations, items, and a brand new action system. 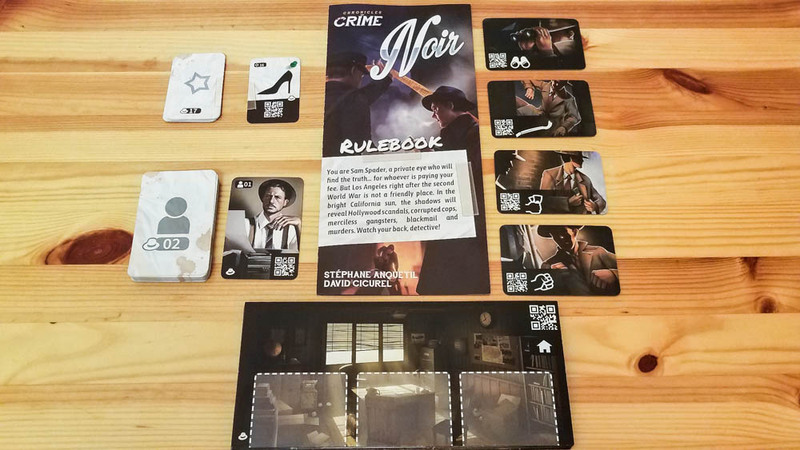 The cases for Chronicles of Crime: Noir were created by Stéphane Anquetil and the game is published by Lucky Duck Games. 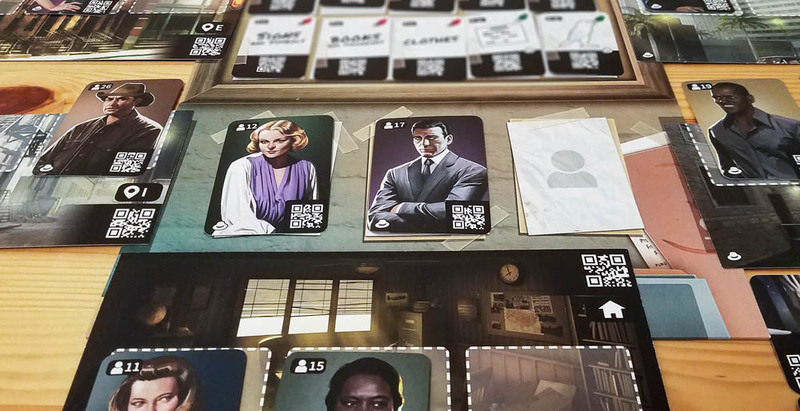 In Chronicles of Crime: Noir, you and your group are collectively working as a single private eye, Sam Spader, in post-World War II California. Unlike in the base game where you’re working for the police and have forensic scientists helping you out along the way, in Noir you’re usually working on your own. You get hired for a fee and you’re attempting to solve cases for your clients. Intimidation – While you’re interrogating, you can attempt to intimidate to get more information. This is a risky action, though, because it could lead to you getting kicked out of a location or worse. Break In – This is another risky action because you could get caught if you stick around too long. Shadowing – You can follow any character that you come across, but this action can take a lot of time. Corruption – If you have any money on you, you can attempt to bribe people to get information or items from them. Time matters a bit more in these cases than in the base game’s cases. You might have to meet someone somewhere at a specific time or someone you’ve already met might randomly show up at a different location later on in the case. Also, you’ll have a set amount of time to solve some of the cases. Other than the new actions and the way that time works, Chronicles of Crime: Noir plays pretty much the same way as the base game. You go to locations, search around for clues, talk to people, and try to solve the cases in a timely manner. There are some unique surprises along the way, but I won’t spoil those here. The new actions in Chronicles of Crime: Noir are awesome! You really never know how characters are going to react to your intimidation and bribery attempts. All of the decisions you make in Noir feel a bit more important than they do in the base game. It feels like anything can happen at any time, so you have to think hard about what you ask the characters you run into and what locations you should visit. My group likes complex cases in detective games, and these were some pretty tough cases. You have a lot of dots to connect and you often don’t have much time to figure everything out. The character cards look fantastic! I’m not sure if they were digitally made using old photos (there are a bunch of recognizable faces) or if they were made from scratch… Either way, they look great. I liked that there was less going on in these crime scenes than in some of the base game’s cases. It was easier to pick out different items, so we never had to get more than two views of the scenes. Sometimes there isn’t enough space for all of the location boards as there are only seven spots and you might have to add an eighth location. Obviously this isn’t a major problem, but it looks kind of odd when one location board is off to the side of the main board. I know it would have driven up the cost of the game, but some narration in the app would have been really cool for these cases. 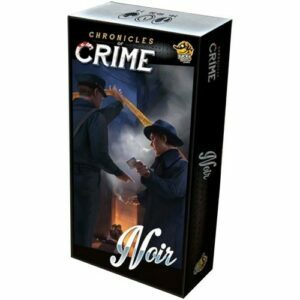 Chronicles of Crime: Noir is a must-have if you own the base game, especially if you like the film noir theme. In my opinion, three of the four cases in this expansion are better than all of the original cases. The cases are well-written and challenging, the cards look great, and the new actions are fantastic. My group only fully solved one of the four cases, but we still had a blast playing through all of them! Thanks for taking the time to read our Chronicles of Crime: Noir review! To stay updated on all things cooperative board games, follow us on Twitter, Facebook, or via RSS.